Passed away peacefully on Thursday 28th March 2019. Dearly loved Husband of Thelma (dec'd). Loved Father and Father-in-law of Raymond & Cheryl, and Kenneth & Anne-Maree. Cherished Grandfather of Scott, Adam, Ryan and Mitchell. Loving Great-grandfather of Dylan, Levi and Xavier. Loved Brother of Eilleen (dec'd), Gwen (dec'd), Colin (dec'd), Jack (dec'd), Jean (dec'd), Les (dec'd), Herb (dec'd), Marge (dec'd), Betty and Mary. 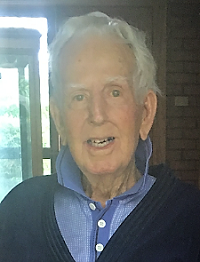 Family and Friends are warmly invited to attend John’s Funeral Service to be held at the White Dove Chapel, McGuiness Funerals, 16 Mogo Place, Billinudgel, on Wednesday 3rd April 2019, at 11.00 am (NSW).